3 Michelin Stars. 27 years consecutively and counting. If there was a Big Daddy of Michelin star restaurants in the UK, this would be the greatest grandfather of them all. 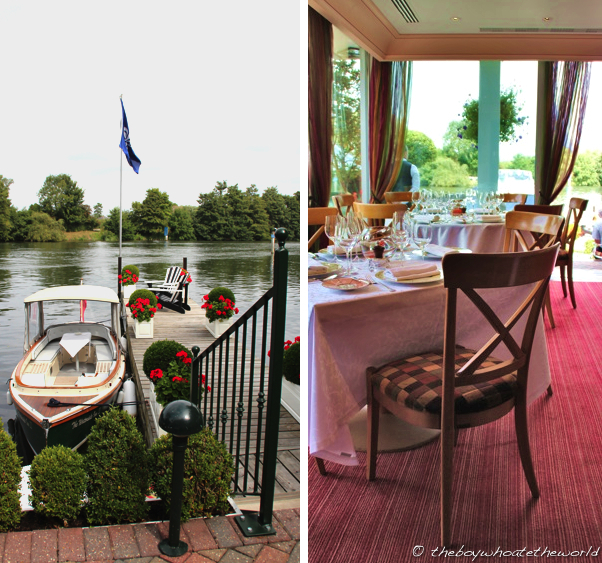 Founded by Michel and Albert Roux in 1972, The Waterside Inn has taken French haute cuisine in Britain to heights never seen outside of the continent. Michel’s more than capable son Alain has since taken over the reigns here, but judging from our recent visit, standards remain as high as ever. The setting could not be more picturesque. Located right on the banks of the River Thames in Bray, long before this little Berkshire village became the gastro-hotspot it is today, the serene waters and greenery of the surrounding woodland provided the most stunning of backdrops for what was easily one of the best dining experiences we’ve had all year. It was a B-E-A-U-tiful summer’s day which meant we could enjoy our amuse-bouches al fresco in their glorious outdoor terrace. And a lovely start to the meal it was. 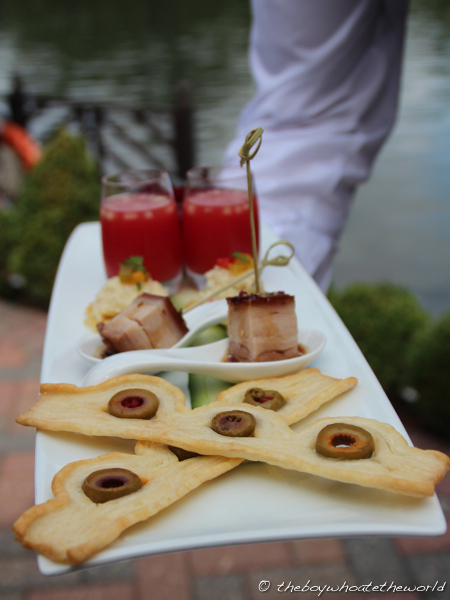 Crisp, melt-in-the-mouth olive pastries… tender pork belly cubes in a tangy, thai-style dressing… salt cod brandade on a crisp-bake… and last but not least, a refreshing watermelon, cucumber and gin shooter. We didn’t take long to decide what to order. It was the other half’s birthday after all so we had plenty of reason to celebrate and splash out on their ‘Exceptionnel’ tasting menu (£150 for 6 courses). In truth, the tasting menu actually offers far better value than the A la Carte. With starters and desserts ranging from £30-£50 each and mains anywhere from £50-£70, going A la Carte could easily set you back more than the cost of the tasting menu anyway. For those not looking to raid the piggy bank, there’s also the choice of their seasonal ‘Gastronomique’ set-lunch menu, available at a more reasonable £58 for 3 courses. We were soon invited to take our seats in their dining room to begin our meal. It was great to see them open up all the sliding doors between the dining room and terrace. On a day as nice as this, the gorgeous waterside view and natural light was streaming in panoramically from all directions. Our first starter of Devon crab with melon, prawns and almonds was beautifully plated with wonderful flavours and textures in interplay. 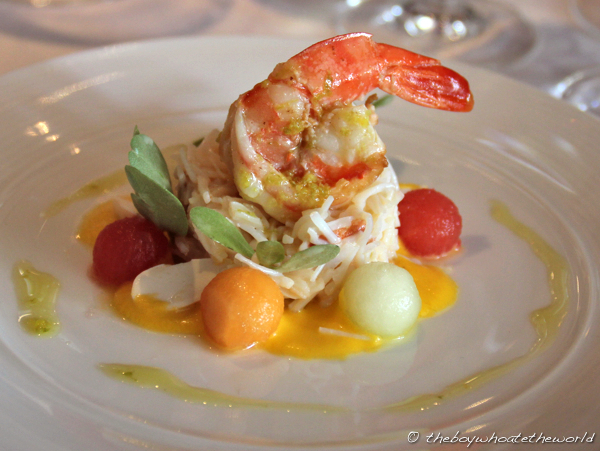 The flaked crab was meaty and sweet with that just-picked freshness. Even sweeter was the plump, juicy king prawn on top, marinated in a zingy citrus marinade. Slivers of toasted almonds brought a nice, savoury crunch to the dish. What I enjoyed most though were the vibrant colours and refreshing burst from the perfectly spherical melon balls. A terrific summer’s dish that really got our salivary glands going. 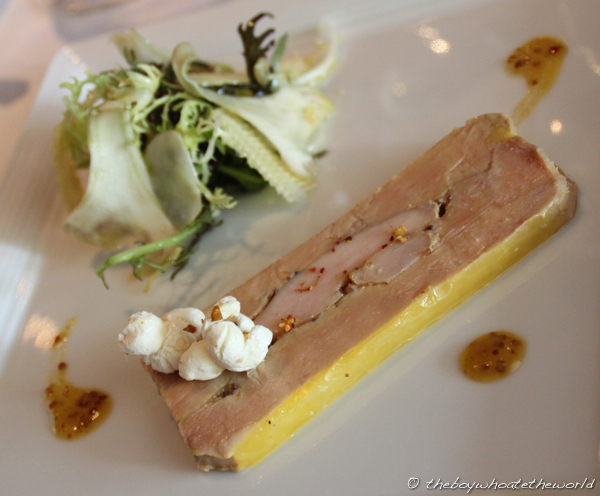 Next up, a whopper of a foie gras and chicken terrine – the size close to that of a large gold bar! A freshly toasted brioche was served promptly after they introduced the dish… so warm they must have legged it straight out of the oven to our plates. The foie gras was pure indulgence… its creamy texture like butter almost. A crunchy, tangy salad on the side helped to cut through the richness, complementing the foie beautifully. The only oddball I couldn’t quite figure out was the popcorn. Frankly, I’m not sure it needed to be there at all. Then came an impeccably cooked scallop, lightly caramelised to a beautiful golden brown on the outside and served with bite-sized chunks of grilled octopus. As with the previous starters, all the elements worked extremely well together. Everything from the velvety celery puree to the tart tamarind demi-glace to the air-light coconut foam played its part in creating a remarkably balanced and delectable dish. For the main course, there was the choice of lamb or duck hence we went for one of each so we could sample the full breadth of what was on offer. And what stonkingly good main courses they were. My rosy pink lamb loin, stuffed with a smoky aubergine confit and grilled pine kernel filling was mouthful after mouthful of absolute joy. Jo’s roasted Challandais duck served with a full-bodied Bourgueil wine sauce, fresh cherries and potato rosti was equally as satisfying. They couldn’t have got the basics more right. Great quality meat, cooked flawlessly. Classic combinations with well-crafted sauces. 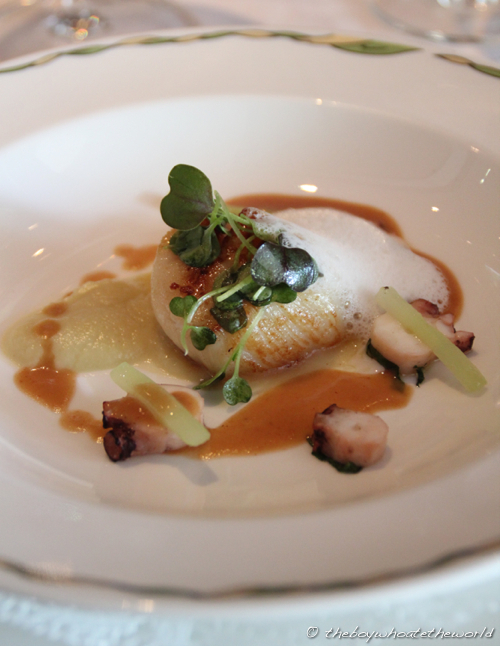 It was a celebration of timeless, no-nonsense French cuisine at its very best. 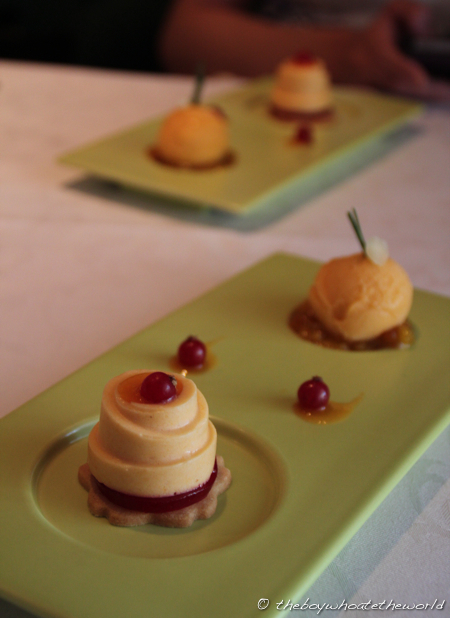 After a refreshing rose petal sorbet to clean the palate, the first of the dessert courses arrived – apricot mousse and sorbet, served with shortbread and red currants. The highlight for me was the sorbet. The fragrant aromas and bittersweet flavour of the rosemary really elevated it to that next level. Each mouthful was like a breathe of cold, rosemary-scented mountain air. Onto the last dessert course. 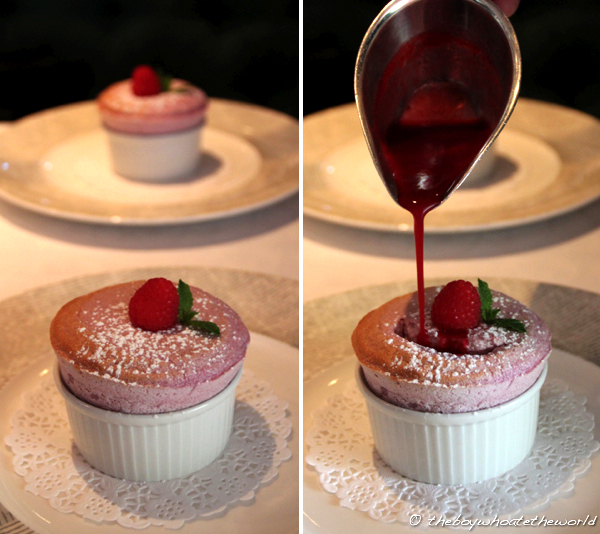 And what would a meal at the Waterside be without their signature souffle. If there was a souffle which all the textbooks out there are based on, this is the one. Warm… air-light… perfectly risen. Filled with a hot, oozey raspberry sauce and just the right amount of sweetness, this was undoubtedly our favourite dish of the evening. In addition to a complimentary slice of birthday cake for Jo to round things off, we also had the chance to meet Alain Roux himself as he made his rounds through the dining room to greet all his guests personally. He was really friendly and amicable, joining in the birthday wishes and was sporting enough to pose with us for a few pictures when we asked! 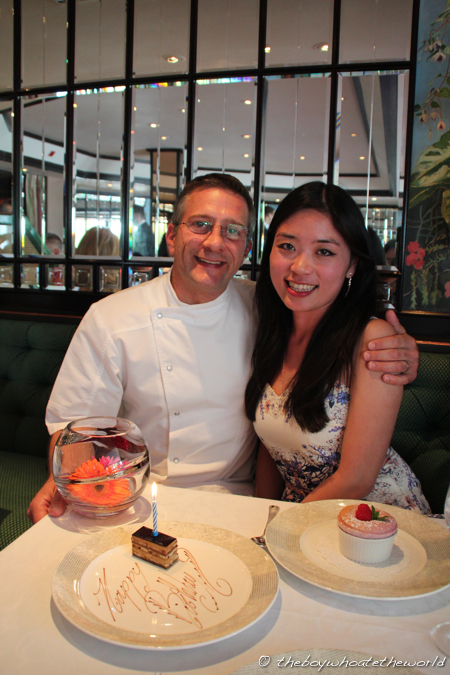 Alain Roux and the Birthday Girl! And lets not forget the hospitality of the brilliant front of house team who definitely deserve a special mention. Be prepared to be pampered to bits by the immaculately dressed waiting staff who have a way of keeping things incredibly warm and relaxed despite the setting and occasion. No glass will go empty. Napkins will fold themselves during bathroom breaks. Plates of food transition seamlessly from one course to the next. Heck, I bet if I decided to sit down without a chair behind me, one would miraculously appear out of nowhere to catch me in freefall. And just check out the quality of the photo they took of us below. It seems mastering SLR photography is a pre-requisite to join the front of house team! We could not have asked for a more perfect dining experience. As with most things in life, you pay for what you get and such 3 Michelin star perfection is by no means cheap. The tasting menu for 2 with a couple glasses of wine each came up to a whopping £350… so unless you’re opting for their daily 3-course set lunch, be prepared to dig deep into your pockets. But few tasting menus in the world offer this level of quality and consistency throughout and I’d argue that the serene setting alone is worth the hour long drive out from Central London. It’s no wonder the Rouxs have managed to keep hold of their 3 stars for over a quarter century. With food as timeless and divine as this, I could imagine having a meal here 25 years down the road and I would still savour every mouthful of it as much as this first time. Those of you out there who think classic French cuisine has lost its mojo should definitely pay a visit here. Nice pictures and musings. When we were there it was unfortunately too cold to sit outside. 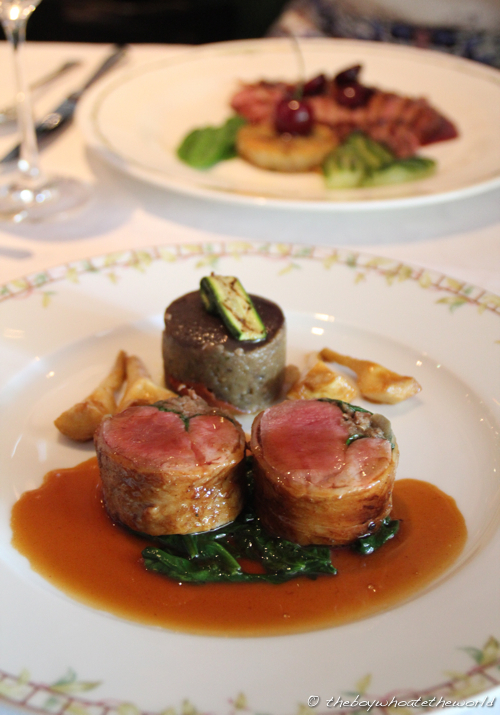 And as you say, Waterside Inn takes up a very special place in the history of UK fine dining. 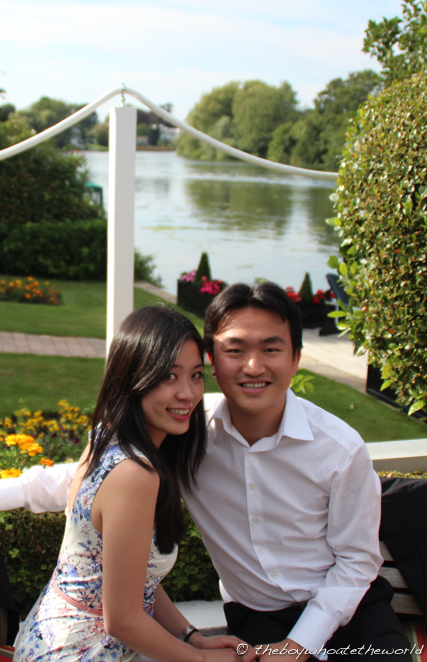 FoodiesOnTheProwl: Yes, we definitely lucked out with the great weather which made the experience all the more perfect. Thanks for stopping by the blog!